This entry was posted on November 1, 2016 at 8:48 am and is filed under Drama with tags 2016. You can follow any responses to this entry through the RSS 2.0 feed. You can leave a response, or trackback from your own site. Nice work sir. Jeez there’s been some great press for this. It has been on my Must See list for sometime, probably since I heard my friend raving about it since he went to Sundance for a second year running. Now I’m thinking I need to drive to the nearest theater playing it, even if that’s hours away! I’m so impatient. In the running for Best Film of 2016. I’m hearing great things about La La Land and Manchester by the Sea so the jury is still out, but it’s going to be hard to top this. I haven’t be able to stop thinking about the film. Certain lines of dialogue…what was spoken and not spoken…certain hues of light…certain facial expressions from the cast…the use of Mozart…some many thoughtful, beautiful, meaningful things. It’s interesting you claim this is Jenkin’s masterpiece. I wouldn’t argue against its mastery of the cinematic form (and its obliteration of genre cliches)…but the depth Jenkins shows here gives me hope that this is only the beginning of a long fruitful career with masterpieces yet to come. His masterpiece to date. I’m certain he has more in him too. I just hope he doesn’t allow another 8 years go by before making another feature. It’s easily among the best films of 2016. Like Fury Road & Spotlight last year or Boyhood & Grand Budapest Hotel in 2014, this will end up on most critics’ Top 10s for the year. Yes I liked Hacksaw Ridge and Loving too. Can’t wait for Arrival! It was fine. Kind of underwhelming although many seem blown away by it. My review is posted. I hope you’re right. A Best Picture nomination seems in order. 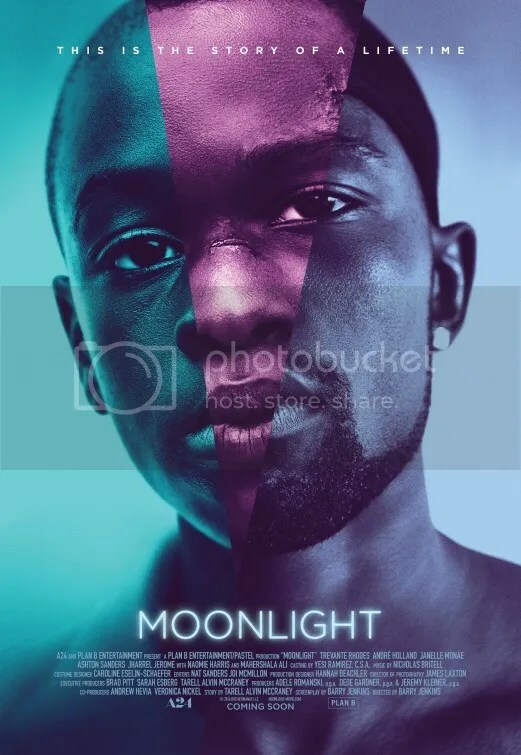 Moonlight definitely avoids the usual coming of age cliches. That’s what makes it so special. I agree that it’s a breathtaking, complex dissection of a life lived. I like how Jenkins takes his time with the narrative and how he uses color and contrast to create the distinct aesthetic for each chapter, as you mention. You’re right that he gives urban landscapes a poetic sheen and he touches on a variety of topics without hitting you over the head with them. I thought that all three chapters came together seamlessly and that was really impressive to me, considering it could be such clumsy construction in the hands of a less talented director. With 8 Oscar nominations, it seems to have struck a chord with the Academy. Possible wins? Best Adapted Screenplay should be a sure thing at this point. Mahershala Ali is pretty certain for Best Supporting Actor as well.